CINCINNATI -- A Cincinnati police sergeant and Fraternal Order of Police lodge president Dan Hils shared two pictures of himself and his daughter, Meghan, on Facebook. Meghan, an 18-year-old with a bob cut and a bright, infectious smile, had lived with chronic health problems from an early age, Hils wrote. She received multiple open heart surgeries as a child, and in recent weeks, her health had declined rapidly. As a four-year-old, according to Hils, Meghan had a request granted by the Make-A-Wish Foundation: she met Loonette, the clown host of PBS’s children’s show The Big Comfy Couch. Later, her father wrote, she would joke that her parents had messed up, since her memories of meeting Loonette faded and pop culture supplied a steady stream of teen heartthrobs she wished she could meet, too. On her eighteenth birthday in March, Meghan became eligible for a wish through the Dream Foundation, a group that grants wishes for terminally ill adults. Instead, Meghan requested a call or video chat with Ellen Degeneres or Jimmy Fallon, two popular talk show hosts whose shows she tapes daily, according to Hils. Still, with her health worsening at a pace that worried her family and friends, Hils worried that the Dream Foundation would not be able to fulfill his daughter’s request in time. So he posted on Facebook and asked anyone who read the post to share, hoping that the power of the internet would carry Meghan’s wishes to their intended recipients. 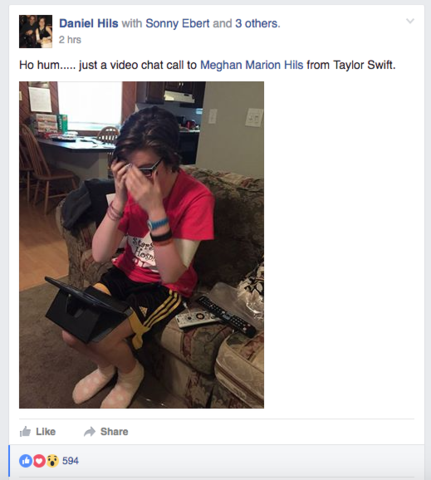 More than 2,000 shares later, Meghan got the call -- not from either of the TV hosts, but from the pop star she had assumed would be completely out of reach. Swift’s camp requested that the family keep her conversation with Meghan private, according to Hils -- no recordings, no photographs of Swift, just a chat between the star and the girl who had wanted so badly to talk to her. The pair talked for about half an hour. Shortly after their conversation, Meghan made a Facebook post of her own. “The words thank you will never be enough to say to Taylor Alison Swift for this day & taking the time to video chat with me for 29 minutes on September 8th, 2016,” she wrote. “Thank you from the bottom of my heart, Taylor."